Have you seen the writing program from Classical Academic Press? As soon as it came out, I knew that I just “needed” to use it. Have you ever seen a curriculum that you knew that you absolutely had to try right away? That might be me every time a new curriculum comes out. It can be a problem. While I don’t advocate switching to every new curriculum that comes out, sometimes you just know that a switch is a good idea. When I looked through this program, I knew it was what I was looking for in our homeschool. So I jumped ship from my current curriculum and dove right in to this new program. Guess what? It worked really well and was an easy transition. Let me share a little bit about why I think it is easy to jump into this program from another writing program. I’ve used both Writing with Ease from the Well Trained Mind as well as Writing and Rhetoric from Classical Academic Press. I began with Writing with Ease and completed Level 1 in 1st grade and Level 2 in 2nd grade with my oldest daughter (who is now in 5th grade). After Level 2, I realized that we were not at all ready for Level 3 (which has some monster dictation passages). I knew that Writing and Rhetoric would be perfect to fill in the gaps and give us something to do while we were waiting to move into the next level of Writing with Ease. I’ll admit, I didn’t realize how much I would LOVE the program from Classical Academic Press. It’s amazing, and my daughter even finds it fun! Yay! Well, we completed Fable and Narrative 1 in 3rd grade. Then we moved into Narrative 2 in 4th grade while completing Writing with Ease as well. For 5th grade I decided that we would only use Writing and Rhetoric as I didn’t feel like Writing with Ease Level 4 would be a good fit for us. And we were both ready for the breath of fresh air that is the Writing and Rhetoric program. (We love the stories at the beginning of every chapter, by the way. LOVE them!) In her 5th grade year, we spent the entire year working on the Chreia/Proverb book and diving deeply into the stories and the writing assignments. Can you cover more than 1 book per year? Do you only complete 1 book in a school year? It can work either way. The books were written to allow for completion in one semester. We’ve used the program this way for some of the earlier levels. However, it’s also ok to take your time and cover only 1 book in a school year, spending more time on the writing assignments and revisions. We’ve done it that way as well! If you’re thinking about using Writing and Rhetoric, you might need help figuring out where to place your child in the program. If you have a student who is in 5th grade or below, it might be worth it to start from the beginning of the program with the Fable level. The Fable book is so much fun. Your child gets to read the fables and then write about them (and write original fables as well). It’s a perfect gentle introduction to writing. I started the program somewhat early with my daughter because she was in 3rd grade – which is the lowest grade recommendation for the program. This worked well for us because she was such an eager writer. However, I have mapped out a different path for my son and next daughter, neither of whom are eager writers like their oldest sister. I can tell that beginning the program in 3rd grade would not work well for them. 1st grade – No writing instruction – only handwriting practice. So, as you can see, I’m planning to use some of the books a little below the recommended grade level. And yes, this is absolutely ok. I would recommend if you have a somewhat reluctant writer who is in 5th or below, it might make sense to start with Fable to get a good overview of the program. This will help your child understand the structure of the program while working with short fables that are less likely to feel overwhelming. It can also help build confidence. Now, if you have a child who is 5th or above and is ready to do a little more writing, the you might want to start with Narrative 1. Also, if you are switching from another classical program that focused on narration, dictation, and modeling, then it would be a smooth transition into the Narrative levels. So, with an eager writer or with a child who is familiar with dictation and narration, it might make sense to skip over the Fable level. The grade level placements are very flexible. You can choose which level is best for your child – but know that the first few levels are very fun with wonderful stories. You might not want to skip them. Just know that I don’t regret starting at the very beginning of the program and I know that starting with Fable with my 4th grade son is going to be the right decision for us. Now what if you are coming to the program after using another writing program that is not classically based? 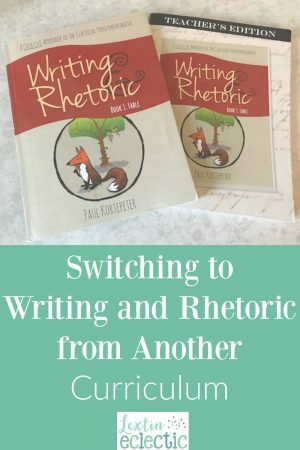 Can you use Writing and Rhetoric? In this case, if you have a 5th grade child or below I would strongly suggest starting with Fable so you and your child can have a good understanding of the classical method of teaching writing through dictation and narration. Can you tell how much we have enjoyed the Fable level at our house? I don’t think you want to miss it! If you’re coming to Writing and Rhetoric from another program, it will be easy for you to use the program even if you have no background in the classical model. This program is incredibly easy to use. The program is open-and-go, which means that you won’t need to do any prep work other than read the first few pages of introduction to the program. The teacher’s guide contains all the answers to each exercise as well as writing samples of the type of work you will want to see from your child. Each level is very incremental and it is easy to learn as you go and build on the previously taught skills. Writing and Rhetoric doesn’t teach writing through the methods you may have learned in school. For this reason, I was a little bit unsure as we jumped into the program. Teaching writing in this way was a little outside my comfort zone. However, now that we have completed 4 levels, I can see the beauty of the classical method. My daughter has been exposed to great literature and excellent samples of writing. She’s learned to do her own writing based on solid, well-written models. Her writing has improved and it’s been a relatively painless process. If you haven’t investigated the classical writing method, I would recommend that you consider Writing and Rhetoric. I think you’ll be pleased with how easy it is to use and how quickly your child progresses in writing abilities. This program has been a huge hit at our house! I hope you enjoy it! It’s been a nice addition to our homeschool and a great follow up to Writing with Ease. I love how it allows the student to be creative but within parameters so it’s not too overwhelming.